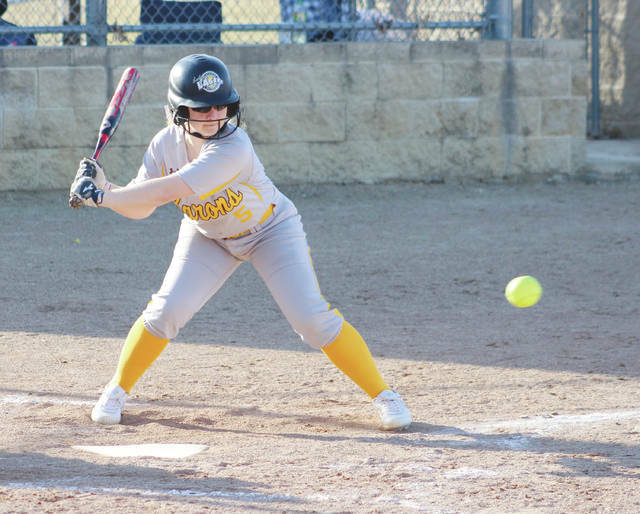 Buckeye Valley’s Lily Irvine prepares to take a swing during the second inning of Wednesday’s MOAC showdown against visiting River Valley. DELAWARE – River Valley can hit. That’s what coach Phil Shepler said before Wednesday’s game and that’s what the Vikings did. RV put a 10-spot on the board in the first inning and withstood a Buckeye Valley comeback bid before scoring 11 runs in the fourth and fifth to win 21-7 in five innings in MOAC action. Shelby Westler had three hits, including a homer and a triple to lead the Vikings. She drove in six runs and scored four times in five plate appearances. Alexis Stevens and Taylor Hecker also had big games with three hits and three RBI apiece and Sarah Lachter drove in four runs for RV, which used a nine-run first inning to run away with yesterday’s game in Caledonia. Eisnaugle and the Barons have been playing with a short deck this week with six players either injured or on spring break, including three starters. BV is without Olivia Schick, Lexi Richardson and Cora Hollingsworth. Richardson suffered a torn ACL in the early fall. Eisnaugle hopes to have her back by the second week of April. Lane Graham played third base for the first time. It didn’t look like it when she snagged a sharp grounder to get the final out in the first. Despite the big opening frame, the Barons (1-3, 0-2) fought back to make it a game again – cutting it to 10-6 before RV’s bats got hot again. Lily Irvine had three hits, including a double, drove in three runs and scored twice and Ashlea Kehl added a pair of hits, an RBI and scored two runs. She also doubled. Irvine, a freshman, took it on the chin in the circle in the first inning, but came back to toss scoreless frames in the second and third before running out of gas in the fourth. Riley Alcorn got the win for the Vikings (3-0, 2-0) and Maize Frank allowed an earned run over 2.2 innings in relief. Next up, BV travels to Olentangy Orange in non-league play Monday night at 5:15 p.m.